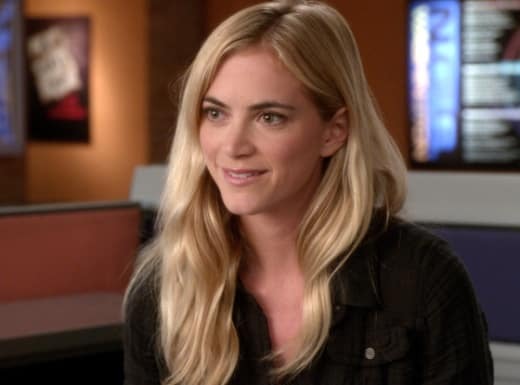 Emily Wickersham is joining NCIS full-time two weeks from tomorrow. The actress, who was cast as NSA analyst Eleanor “Ellie” Bishop before the season premiere in September, has already been promoted to a series regular, CBS announced today. Wickersham was originally slated for three episodes, but according to NCIS producers, her work with the team proved a success and they made her role permanent. “Emily Wickersham’s Ellie Bishop is proving to perfectly compliment the NCIS team,” said executive producer Gary Glasberg in a statement. ”Her energy and enthusiasm is contagious." In September, when the actress was cast in the role and Glasberg disclosed that Wickersham "could" become a series regular down the line, he added that his intention wasn't to "replace" Ziva. However, "I can introduce a character who is unique and quirky and fun, and hopefully people will embrace her and feel like she is a new element to this group and a new part of moving it forward." Wickersham, whose first episode airs November 19, fills an empty series regular spot on the show that has been there since the second episode of the current season. Cote de Pablo's exit has been a focal point of NCIS Season 11 so far. Even though she only appeared on one installment this fall, her sudden departure has been a lingering factor. Michael Weatherly, whose character Tony has been most impacted by Ziva's departure, tells EW, “We’re excited about having Emily join us on these little adventures we do every week." "Seeing how she is in the world that we create together,” Weatherly added, has been a success from the start. “I hope the audience likes her as much as we did right away." CBS describes Bishop as "a mysterious mixture of analytic brilliance, fierce determination and idealism who specializes in international threat assessment and global preparation." She'll be introduced "when it is discovered the Secretary of the Navy was bugged during a confidential briefing, a security breach Bishop described in exact detail two years ago in a threat analysis report." "Working side-by-side with Gibbs and the team," the release states, "Bishop cross-examines the case file to help determine who is behind the crime." Are you excited for her debut? Share your comments with us below!